West Ham deserved to win. It is worth highlighting that fact lest it be obscured by the fallout to Chelsea�s disciplinary meltdown. The champions had Nemanja Matic sent off in the first half, two players booked for protesting against that decision, their assistant first-team coach, Silvino Louro, dismissed for haranguing the fourth official and José Mourinho banished to the stands at half-time. The Portuguese manager has recently taken to describing referees, whose performances displease him, as �weak and naive� � pointedly borrowing the term from Arsène Wenger � but this was a demonstration of strength by referee Jonathan Moss, who was not prepared to let Chelsea personnel tell him how to do his job. Chelsea did not do their own job as well as champions should. Defensively it is they who have been weak and naive this season. There were suggestions before this match that they were improving on that front � two consecutive clean sheets served as evidence � but West Ham ran a serious stress test and Chelsea failed it. Even amid a cagey opening there were signs that betrayed the principles that Mourinho teams have traditionally applied, with Cesc Fàbregas, deployed in an advanced midfield role, acting as the sort of luxury player that the Portuguese has never tolerated. The Spaniard seemed sluggish at the start and his unconvincing tackle on Dimitri Payet in the 16th minute led to the home side�s opening goal. The Frenchman took the resultant 25-yard freekick himself. He had fired over the bar from a similar distance earlier but this effort was more accurate and forced Asmir Begovic to improvise a save, the goalkeeper tipping the ball over the bar to concede a corner. Payet delivered the set- piece and Diego Costa, one of Chelsea�s most energetic performers, botched an attempted clearance, allowing the ball to bobble out to the edge of the area, where Mauro Zárate arrived to lash a splendid low shot into the net. �You�re getting sacked in the morning!� crowed the home fans as Mourinho fumed in the dugout. The visiting manager knew that his team would now have to pierce hosts who could afford to play as they had when achieving memorable victories away to Arsenal, Liverpool and Manchester City this season. It was a while before Chelsea looked like rising to that task but eventually they did summon more intensity and creativity. Kurt Zouma came within millimetres of equalising from a corner but Manuel Lanzini scrambled the right-back�s close-ranger header off the line. The home side remained dangerous on the counter-attack. Begovic blocked a James Collins header in the 36th minute. Moments later, Payet should have doubled the home side�s lead after being put through courtesy of a beautiful flick by Payet. 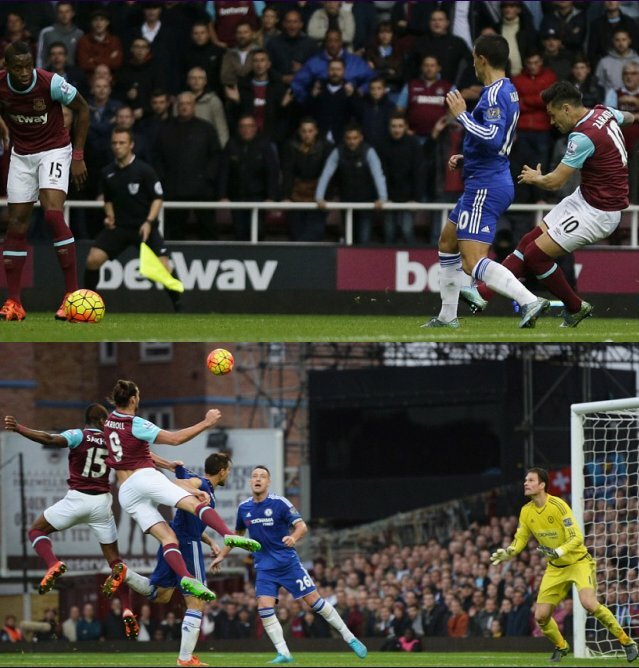 Lanzini clipped the ball over the advancing Begovic but it flew over the bar, too. Costa put a proper clearance on a West Ham corner in the 44th minute and it led to a wonderful counter-attacking chance, with four Chelsea players racing towards two West Ham defenders. Willian slipped a pass through to Fàbregas, who cracked a low shot into the net � but the Spaniard was ruled to have been offside. Within a minute Chelsea lost a player and the plot. Matic, on a booking for a previous foul on Lanzini, was adjudged to have tripped Diafra Sakho and was shown a second yellow by Moss. The visitors surrounded the official to vent their anger. That, at least, was like the old Chelsea. Moss showed two of the offenders, Fabregas and John Terry, yellow cards and then sent Louro to the stands for berating the fourth official. Mourinho watched the second half from the directors� box, having been ordered not to return to the sidelines. A man down on the pitch and two down in the dug-out, Chelsea faced a stern character test now, on top of their footballing trial. Their initial response was decent. With John Obi Mikel introduced for Fàbregas during the break the visitors got a grip on the game despite their numerical disadvantage. Eleven minutes into the second period they drew level, Gary Cahill whacking a bouncing ball into the net from close range after Zouma flicked on a corner. West Ham battled to regain the upper hand. Payet was a constant menace, probing and conniving relentlessly. But with Mikel joining Ramires in protecting the back four, Chelsea defended well. Mourinho�s men retained their ambition to attack when they could. Ramires should have made Adrian work in the 77th minute after being teed up by Eden Hazard, but the Brazilian miskicked from 16 yards. That proved costly, as two minutes later, Slaven Bilic�s decision to spring Andy Carroll from the bench paid off. The striker leapt to meet a fine cross from the left by Aaron Cresswell and sent a powerful header into the net from 10 yards. Chelsea�s fifth league defeat of the season was complete, their problems nowhere near over.